Botrytis (also known as Gray Mold) attacks weak plants or dying flowers. In fact, in nature it helps the recycling process of plants by breaking them down and making the nutrients available in the soil. So the fungus actually plays a vital role in the natural growth cycle. But when it strikes your crops, it’s a pest! The early development of gray mold usually starts in infected plant debris from previous crops, which have been left in the field. The mycelium present in the debris begins to develop when temperatures increase, for example in early spring. In bright light, the mycelium begins to produce structures called conidiophores. At the end of these conidiophores, spores called conidia are formed which are then transported through the air and can come into contact with the leaves or stems of crops. The fungal infection in flowers is not visible initially. 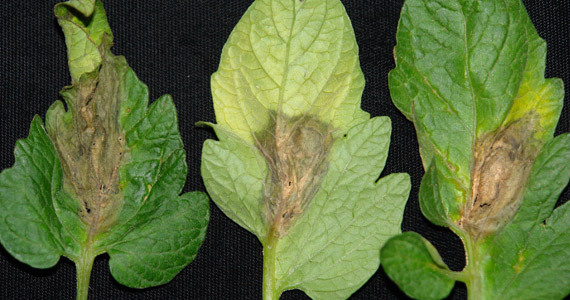 Necrosis – tissue that looks brown and wet near the infection site – is one of the first symptoms that indicate a possible Botrytis attack. A lighter colored spot on the flowers with a dark brown ring around it can also indicate a mold infection. You must never allow the infected plant or parts of the plant to come into contact with other plants, because even the briefest contact will send clouds of gray spores into the air. These spores will land on healthy plants and may infect them. Good ventilation is essential in order to maintain slightly lower humidity around the leaves and flowers. For outdoor crops, it is advisable to cover the plants with a plastic shelter like a poly-tunnel when rain is expected. This prevents the plants from getting wet. It is also important to be vigilant for pests such as caterpillars which can cause damage to the cuticle, which B. cinerea can exploit to enter the plant more easily. It’s easier for the fungus to infect plants that have been damaged by chewing pests. 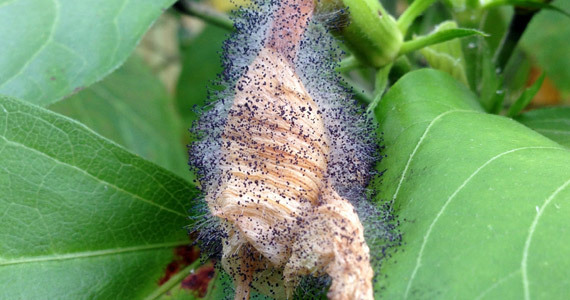 Other insects like thrips can carry and spread Botrytis spores. Several micro-organisms have proven successful in controlling B. cinerea in a wide variety of crops. Clonostachys rosea (= Gliocladium roseum) is a fungus that is used to combat and prevent Botrytis attacks because of its ability to suppress the production of spores. Some nematode species have also been used to control gray mold effectively. Many plant extract preparations are marketed primarily as being able to prevent the attack and development of B. cinerea. Good results have been achieved with extracts of thyme, citrus seed, oregano, mint, garlic and pepper, to name a few.